Neha Dhupia walks on ramp displaying the creation of designer Rahul Mishra during the Blenders Pride Fashion Tour 2015 in Gurgaon. Kangana Ranaut unveiling the art of Suvigya Sharma in Mumbai. Model displaying a creation by designer Abraham & Thakore during the Blenders Pride Fashion Tour 2015 in Gurgaon. Eddie Murphy with Paige Butcher arrives at the Kennedy Center for the Performing Arts for the 18th Annual Mark Twain Prize for American Humor presented to Eddie Murphy in Washington. 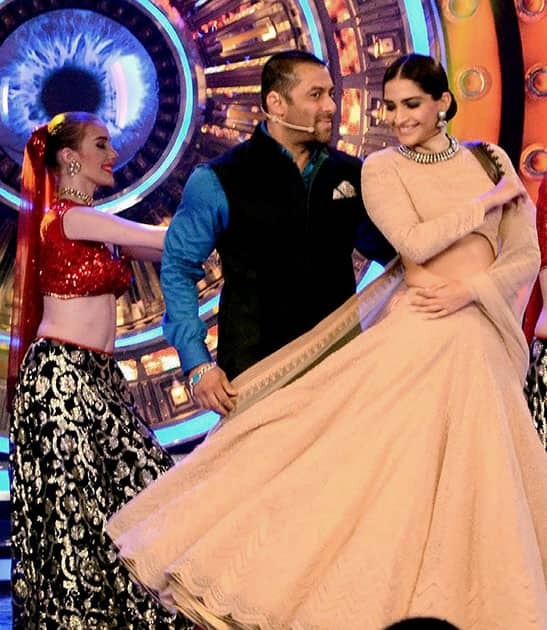 Salman Khan and Sonam Kapoor perform during promotion their film Prem Ratan Dhan Payo on the set of Bigg Boss in Mumbai. Michael Fassbender and Kate Winslet pose for photographers upon arrival at the premiere of the film Steve Jobs, as part of the London film festival in London.